La Crosse, WI – The 2014 Texas 4000 rolled into La Crosse after 28 days and 2000 miles of biking. 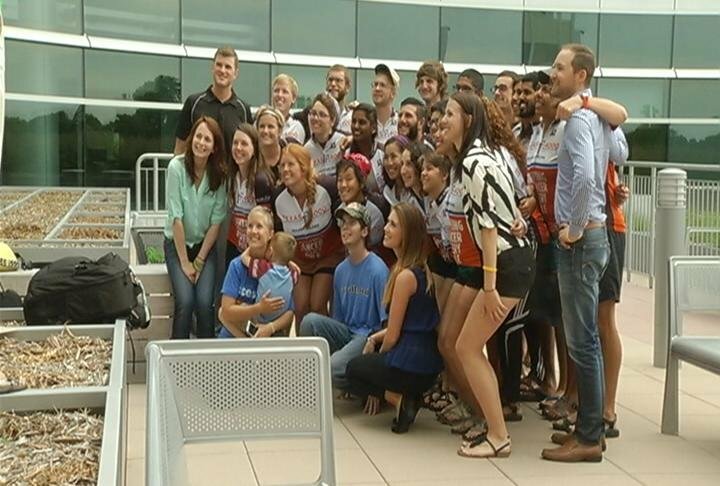 The Texas 4000 is the longest bike riding charity going from Austin Texas to Anchorage Alaska. The trip takes about 18 months of training to prepare for 4000 miles of biking in 70 days. There are about 90 total students in the journey that are split into 3 groups that tour North America before reuniting in Alaska. A group of about 20 University of Austin students visited the Legacy Building of Gundersen Lutheran Health System to share stories of how cancer has affected their lives as well as hear from the cancer survivors from the support group,”Bump in the Road,” and take a tour of the new building at Gundersen. This is the 11th year of the Texas 4000, and the second time it has stopped in La Crosse.